This is the place for the fudge taste sensation that you have been searching for! 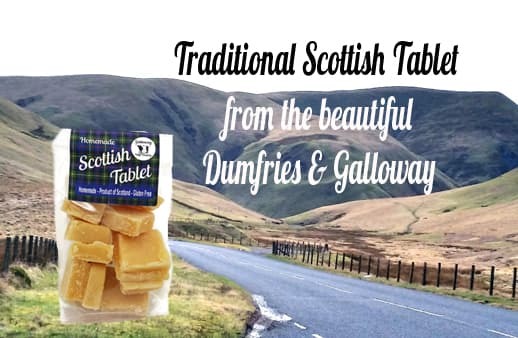 Handmade in the beautiful Dumfries & Galloway countryside and enjoyed all over the world. Galloway Fudge is by far one of the finest, smoothest, mouth-watering fudges you will ever have tried. A perfect gift for all fudge lovers.... creamy, delicious, handmade fudge - from the classic Creamy Vanilla and sophisticated Dark Ginger Treat to fruity Raspberry Ripple or a little bit of Marshmallow Magic. Rich Milk Chocolate - 150g tub Gluten Free & Vegetarian ~ classic s..
Rum & Raisin Indulgence - 150g tub Gluten Free & Vegetarian ~ lu..
Yummy Caramel - 150g tub Gluten Free & Vegetarian ~ a traditional r..